Did Trump Break the Law With His Executive Order on Regulations? A new lawsuit filed in DC makes the case. An emergency lawsuit seeks to overturn a Trump administration executive order that could have dire consequences for public safety and well-being. I’m not talking about the executive order on immigration but about the one on regulation, which three groups are seeking to overturn in the Washington, DC, federal district court. In the lawsuit, Public Citizen, the Natural Resources Defense Council, and the Communications Workers of America argue that the order, among other things, “directs federal agencies to engage in unlawful actions” that violate the statutes governing their existence. 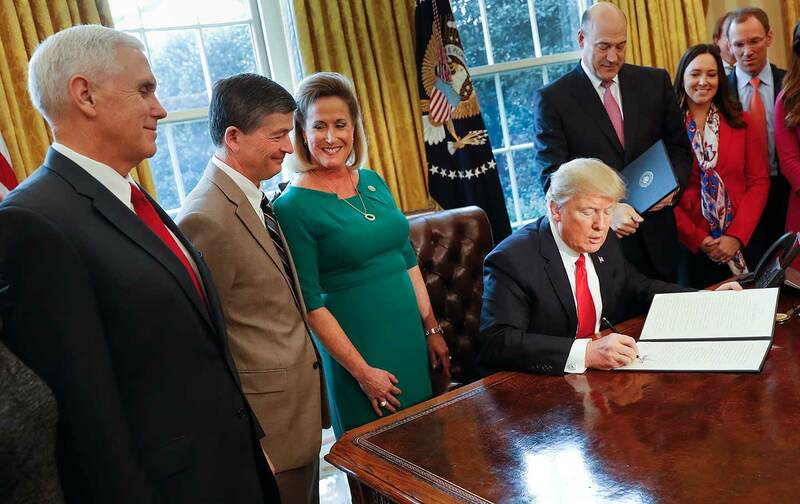 In the blizzard of signing ceremonies, you might have forgotten that Trump issued an executive order mandating that federal agencies eliminate at least two regulations for every one they bring into existence, and that the total net costs of regulations on individuals and business entities in 2017 must be $0. In other words, costs of any regulation must be offset by repealing regulations with equivalent costs. As I’ve noted, the regulation order, which applies to“significant” regulations costing $100 million or more, was little more than a paperwork generator, forcing federal agencies to perform all sorts of analyses and make public comments before they could ever get a regulation out the door. The interim guidance on the order from the Office of Management and Budget (OMB), issued last week, makes this even more clear. First of all, the OMB exempts “purely deregulatory actions that confer only savings to all affected parties,” making the order a one-way ratchet. Second, the definition of “costs” does not take into account the benefits from consumer, environmental, or safety protections. The OMB specifically says that, for example, cost savings to consumers for regulations requiring energy-efficient technologies in home appliances “would not be counted as offsets to costs.” So to simplify a bit, if Maytag has to spend $100 on a washer-dryer by adding energy-efficient controls, and it saves the purchaser $1,000 in energy costs over the life of the appliance, the OMB sees that regulation as “costing” $100, and the Department of Energy would have to cut a regulation that costs $100 to offset that. Net benefits from regulation are extremely common. A draft report from the closing days of the Obama White House found annual benefits of all major regulations from the past 10 years totaling between $269 billion–$872 billion, with costs between $74 billion–$110 billion. At worst this shows more than a 2:1 advantage from benefits, and at best nearly 12:1. But all those benefits can’t be accounted for under this executive order, which is a clear signal of the real intent. “By irrationally directing agencies to consider costs but not benefits of new rules, it would fundamentally change our government’s role from one of protecting the public to protecting corporate profits,” said Public Citizen president Robert Weissman. Agencies would have to do new estimates of the costs of regulations and cannot rely on their previous assessments, OMB writes. Also, the costs already incurred—for example, if companies had to purchase and install new equipment to comply—wouldn’t count, just the costs going forward. This greatly magnifies the impact, since repealing one regulation would institute far less cost savings. This is all just regulatory harassment—an attempt to badger federal agencies into ignoring their missions with a falsely constructed argument that it’s not worth it to make regulations. More important, the lawsuit asserts it is all unconstitutional. No statute for any federal agency imposes a regulatory budget where costs have to be offset. Any agency complying with the order would be acting inconsistently with the law that created them, along with the Administrative Procedures Act, which also says nothing about cost offsets. And failing to take benefits into account makes the mathematics of the executive order ridiculous. The order does hedge a bit, stating it can only be “implemented consistent with applicable law.” But that points to a fundamental paradox: If laws authorizing a federal agency to write rules control what it can engage in, “that language would render the executive order without effect,” the lawsuit notes. The lawsuit cites 10 statutes that could be impacted by the order, governing everything from motor-vehicle operation to toxic substances to workplace safety to air and water pollution. Under the executive order, agencies wouldn’t be able to include the benefits of preventing car crashes, avoiding mining disasters, or stopping the poisoning of citizens in setting rules. And the agencies implementing these laws would have to violate the law in the process, by taking out regulations at the same time it puts them into place. “Under the Constitution, the President lacks the authority to direct federal officers or agencies to act in derogation of the statutes,” the lawsuit states. With the rogue’s gallery Trump is appointing to federal agencies, the likelihood that they would issue any beneficial rules was already suspect. But the executive order on regulation represents a separation-of-powers issue. As the three groups point out, Congress may be able to institute a regulatory budget, but the president can’t just do it by fiat. Whether the DC district court agrees, and ultimately the Supreme Court, remains to be seen. And that introduces some danger into this lawsuit. It could codify the executive branch’s ability to effectively amend congressional statutes by hamstringing the rulemaking process. The other possibility is that the courts will rule that Public Citizen and its colleagues don’t have standing to sue over this. The groups argue the regulation order adversely affects their health and welfare, and the ability to advocate on their members’ behalf, since pushing for a regulation will result in the repeal of others. It’s unclear whether the courts will accept that. If nothing else, this and other lawsuits can fight the growing perception of government by edict. Chief executives arrogate power in virtually every presidency, from Washington to Obama. The courts are often reluctant to intervene. But resistance to this extreme view of presidential power is essential if we are to retain our democracy.